Create Group: Fill in Group Name and other info. Group quotas are optional. 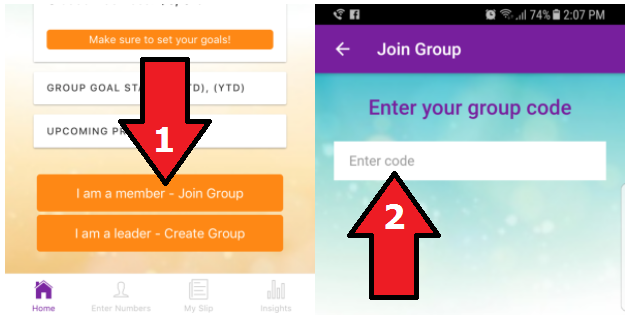 Confirm Group: Click “Setup Group”; your 30-day free trial will begin. Home: View goal status and upcoming presenters. Enter notes you can refer to for your 60 sec commercial. Enter Numbers: Similar to filling out a paper slip. Select your group members from the drop down menus. Click the orange button, “Add to Slip”. You can record activity throughout the week or during your meeting. My Slip: Similar to reading off a paper slip. View all of your activity since your last meeting. Click the orange button, “I Was Here” to record your attendance at the meeting. Menu: Access additional screens to set goals, view running totals, and see your profile. Group Leaders can schedule presenters and view their admin page.